Top Chef is always known for its share of twist and turns. Sometimes contestants can be eliminated at a moments notice. Contestants can also be welcomed back into the competition simply by winning a cook off. BOTH of these happened on the latest episode of Top Chef, really stirring up the kitchen. of a tomato water. Melissa added Thai elements to her chowder with lemongrass and ginger. Gregory got out of his funk and turned his chowder into the winning dish adding in flavors of bacon and coconut milk. He walked away with immunity, which is HUGE in this stage of the game. That was not even the most exciting part of the Quick Fire. Suddenly, the small challenge about chowder became a sudden death quick fire, putting the rest of the chefs on the line for elimination. Katie came off with the worst dish for the remaining chefs. Jasper was not feeling the amount of raw sour dough that she added to her soup, claiming that it over took the dish and left out the main flavors. Katie was up for elimination, but this was not the typical sudden death quick fire. Without any warning, ALL of the previous eliminated contestants burst through the kitchen doors creating a whole new ball game. 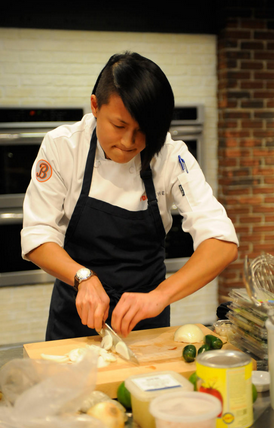 The eliminated chefs were granted the opportunity for one of them to get back in the game, if they could beat Katie. George was voted in by the eliminated chefs for the spot. George was the right choice for this. He was eliminated because of a faulty relay race era. No one EVER got to taste his food. For all we know, he could really be the one to take it all. Katie and George then went head-to-head cooking rabbit. Katie came up short with an under braised cut, taking herself out of the competition and allowing George to take her spot. HUGE GAME CHANGER! Was it a fluke that he beat Katie or could George actually cook!? Now for the actual elimination challenge. The chefs would be cooking for Top Chef superfans. Seems like a simple challenge, right!? The main catch here is that the chefs would not be shopping for themselves, rather the judges would be the ones doing the shopping. The contestants would draw knives to see whose pantry they would be cooking out of. They would not find out what kind of food they were cooking until they entered the kitchen. Now if I were participating in this challenge, I would want to stay clear of Richard’s pantry. While all of that molecular gastronomy seems like an awesome cooking technique, I would not have the slightest clue of what direction to go in. If I had a choice I think I would have liked Gail’s pantry. It would be ingredients to create a cohesive dish with enough risk taking involved. Adam and Doug drew Richard’s dreaded pantry, Katsuji and Melissa got lucky with Gail, Mei got Tom’s, and George and Gregory drew Padma’s. Adam was the only one who was unhappy about his choice, for the same reasons I would be. The rest of the chefs seemed happy and thought they would be able to work with what the judges gave them. Watching the judges shop could be a show in itself. They all seem to be out of their element, except for Richard who went right back into contestant mode. The rest of them stuck to their own schedule. Padma dropped her fish and Tom took ALL the vegetables. There isn’t much strategy behind the amount food they were taking, yet they were giving their chefs enough variety to make a complete dish. George, rounded out the top three. 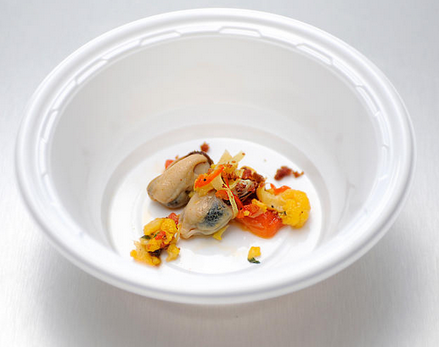 Doug took the win with his chorizo-marinated mussels dish. This left Adam, Mei, and Melissa on the bottom. Katsuji took the very last spot playing it safe in the middle. I really hope Katsuji steps up his cooking game because he sure makes the show that much more entertaining. Mei, Adam, and Melissa all had excellent dishes, but they all fell short of the judges expectations. Melissa suffered from an eh dish, showing no special technique and really playing it safe. Mei and Adam fell short to cooking mistakes, both under cooking their proteins. Adam however, fell victim to his dish. His flash cooking of the shrimp simply did not pay off in the long run leaving a “squeaky” taste in the judges mouths. The next few episodes are sure to be interesting. I really want to see what George can do and if he really will be a threat to the other chefs. Either way, the bar has definitely been raised.